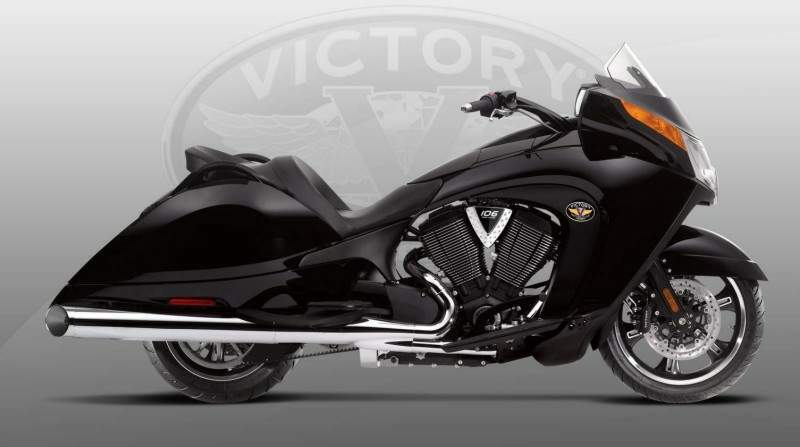 The Victory Vision® 8-Ball Motorcycle is a blacked-out distance cruiser motorcycle for those riders who like streamlined touring motorcycle riding. Its style & performance are awesome and its value can't be denied. The Victory Vision® 8-Ball is a no-frills cruiser motorcycle that hits the open road with only the essentials. It has a powerful Freedom® V-Twin Engine, blacked-out features and side storage. For smooth, powerful, no-nonsense cruising on Main Street or touring across state lines, the Victory Vision® 8-Ball provides a fantastic experience. Find out more about its features, specifications, pricing, comparisons, reviews, videos, images, brochures, downloads, and locate your nearest dealer that has the Victory Vision® 8-Ball Motorcycle. This stealthy-looking 106ci/1731cc engine delivers 97 horsepower and 113 ft-lb of torque, ample power for city sprints and highway cruising. Electronic Fuel Injection keeps it smooth and efficient. There's smooth shifting through the greats, and in 6th - which is a true overdrive - the RPMs drop for smooth, efficient highway cruising. Plus, there's still power for passing without downshifting. Enjoy consistently outstanding braking with these dual 300mm floating rotors equipped with 3-piston calipers. They provide sure stopping that inspires confident riding. Smart, custom-styled "Roulette" wheels give the bike a great look and roll smooth and true. Their primarily black finish complements the bike's styling. From the "less is more" school of style, this low windshield gives the bike a clean, sporty look. Higher windshields are available as accessories and are easy to install or remove.